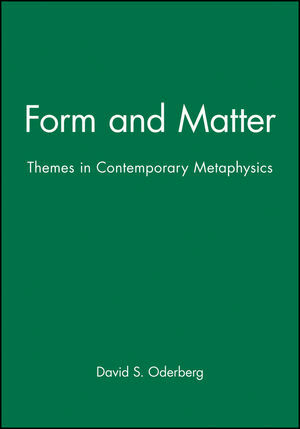 Form and Matter is a collection of six papers by leading philosophers on topics in contemporary metaphysics looked at from an Aristotelian perspective. Topics covered include substance, material constitution, the metaphysics of mind, the nature of mixture,and the analysis of what it is to be a living thing. David S. Oderberg is a lecturer in philosophy at the University of Reading. Author of The Metaphysics of Identity over Time (1993); co-editor of Human Lives: Critical Essays on Consequentialist Bioethics (1997). 1. Form Without Matter (E.J. Lowe). 2. Farewell to Substance: A Differentiated Leave-Taking (Peter M. Simons). 3. A Return to Form in the Philosophy of Mind (John Haldane). 4. Mixing Matters (Kit Fine). 5. On the Unity of Compound Things: Living and Non-Living (Joshua Hoffman & Gary S. Rosenkrantz). 6. Sameness Without Identity: An Aristotelian Solution to the Problem of Material Constitution (Michael C. Rea). Collection of original papers by leading philosophers on issues at the forefront of current metaphysics. Concise and fascinating overview of the way Aristotelian philosophy is being applied in exciting ways to contemporary problems. Ideal introduction to some of the central issues in contemporary metaphysics.